Holy Angels Charles Johnson (3) fights off a Crusader defender Tuesday night at St. Croix Lutheran. Photo by Korey McDermott, SportsEngine. Wintery conditions didn’t do Holy Angels any favors as the team made the drive east through rush hour traffic to make Tuesday's game at St. Croix Lutheran. The 13-mile bus ride took about 90 minutes. However, the longer-than-expected journey did not seem to affect the team's play In fact, Stars coach Andy Hannan said they appeared to enjoy it. "Maybe if anything, it bonds the guys on the bus," Hannan said. "Having fun, goofing around." The trip took so long that the JV game, slotted in front of the varsity bout, had to be shortened to 14-minute halves in order to allow the featured matchup to start close to its scheduled 7 p.m. start time. That scheduling tweak proved moot when the JV match took two overtime periods to determine a winner. 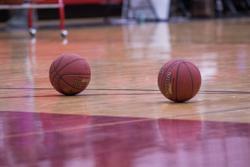 When it finally came time for the varsity teams to hit the floor, the Stars put the weather out of mind. Then they used a second-half run to break a 55-55 halftime tie to outscore the Crusaders by 20 points in the second half, resulting in a 95-75 victory. It’s been a breakout season for the Stars (16-2, 3-1), the No. 10-ranked team in Class 3A by Minnesota Basketball News. 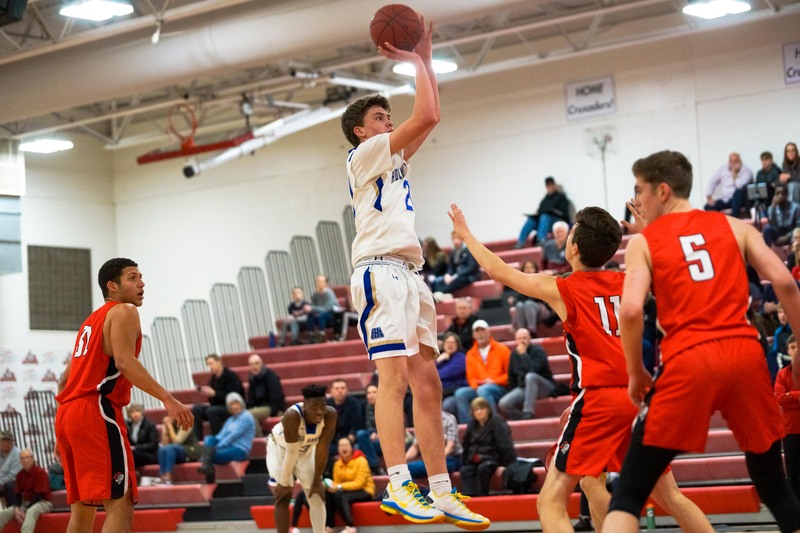 Last season, Holy Angels finished its season with a 9-19 record, after suffering a 62-36 loss to St. Thomas Academy in the second round of the Class 3A, Section 3 tournament. Now, the Stars are gunning for a potential top seed in the section playoffs with seven regular-season games remaining. And maybe even more important, the Stars have been able to improve their bond off the court as well. "We hang out, we're all good friends," said Thor Holien, Holy Angels’ senior center who scored 26 points. "We spend a lot of time together." Touting 16 victories to date this season, the Stars' only losses have come against state-ranked teams. No. 9-3A Waconia defeated the Stars 65-63 at the St. Thomas Holiday Shootout tournament in December and their other loss came in a 96-63 decision to No. 1-3A DeLaSelle on Jan. 17. Holy Angels will play the Islanders again this Friday. What has helped the Stars improve? Holien points to the team’s mentality. "Everybody's got leadership, everybody brings something to the table," he said. "We all kind of work together really well." For St. Croix Lutheran (9-9, 3-0), the goal this winter has been continuing to grow after losing most of its starters from last year's squad that played in the Class 3A, Section 3 championship. 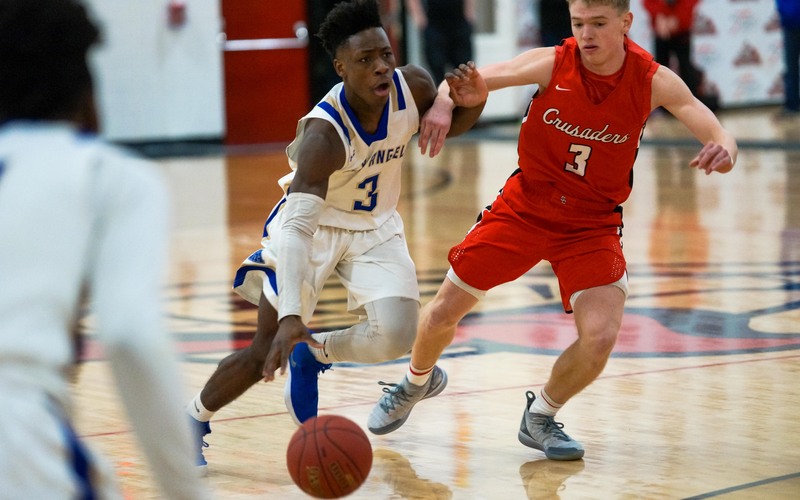 The Crusaders, who lost just nine games in the regular season a year ago, fell to St. Thomas Academy 63-59 in last year’s section title game. But six seniors graduated, and coach Jay Wendland said only one starter from a season ago returned in the fall. "We've seen great growth throughout the season, but tonight, defensively especially, we struggled keeping that ball in front of us," Wendland said. St. Croix Lutheran kept it close with Holy Angels until there was about 13 minutes remaining in Tuesday night’s Tri-Metro Conference tilt in West St. Paul. But then Thor Holien and the Stars, ranked No. 10 in Class 3A by Minnesota Basketball News, streaked. Tied 55-55 with 13 minutes, 30 seconds left in the second half, Holy Angels (16-2, 3-1) took control and did not look back in a 95-75 victory. Holien scored 22 second-half points, after tallying just two first-half points in what had been a competitive game until the run began. The Stars’ Max Gerstner added 21 points and Charles Johnson had 19. Zach Longueville scored 17 points to lead the Crusaders (9-3, 3-0), while Quincy Hardel-Davis contributed 14.